Home Food Trucks Was This Chicken Vindaloo Curry Any Good? Feel like Chicken Vindaloo Curry? Well, we got a tip from a reader about a new Indian food truck that has popped up around town called Mausam Curry N Bites. Thank you Jim L. for sending us the tip. Mausam means “seasons”, and their philosophy is “A variety of fresh food and spices for all tastes and seasons”. Mausam started as a restaurant and banquet hall in Secaucus, NJ, and recently opened this food truck in NYC. 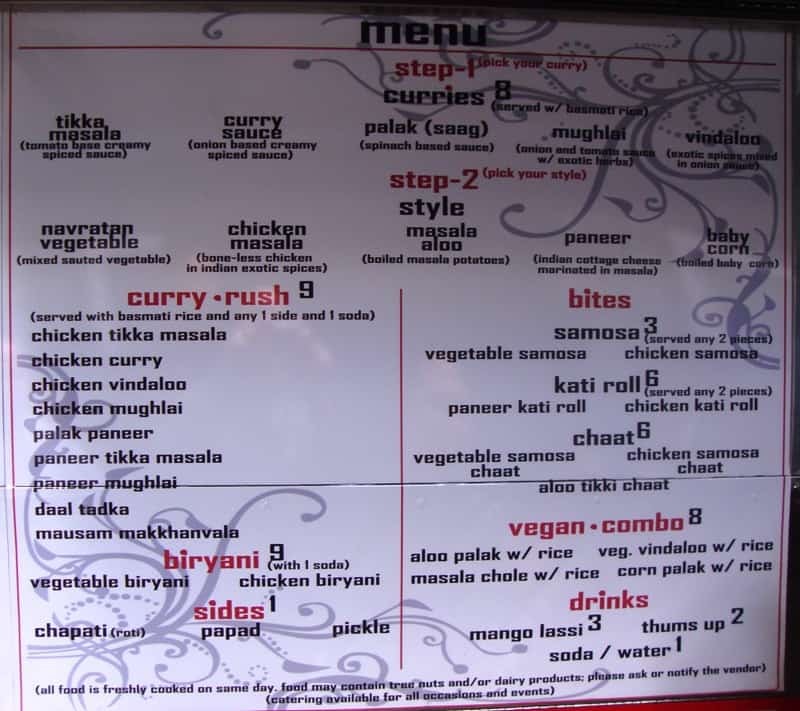 The menu has a large variety of curry, rice, meat and vegetable combinations, along with small bites including chaat, samosas and kati rolls. If you want, Mausam has a build-your-own menu where you can mix and match different main courses and sauces, but that was too much thinking for our first time there. We went with Chicken Vindaloo Curry from the Curry Rush menu, which are complete meals including rice, side dish, chapati bread and soda for $9. Upon opening the container, those wonderful Indian spices immediately hit your nose. Indian food has to be among the most aromatic on the planet. Our preferred method of attacking this Chicken Vindaloo Curry dish is to tear off pieces of chapati bread, and use it to scoop up some chicken vindaloo. This gives us 5 or 6 good bites of pure chicken and sauce. Then, when all the chapati bread is gone, we use the fork to eat the remaining chicken and basmati rice, that has the rest of the sauce. In the case of vindaloo, there are 2 sauces. One is an almost-sweet brown sauce, and the other one is a fiery hot red sauce. The meat was boneless cubes of chicken. It was a little dry, but there was plenty of sauce to make up the difference. On the other hand, the basmati rice was plenty moist, and it had a nice flavor from the spices, probably cloves, cinnamon and a few other spices. Mausam seems to travel around to different neighborhoods for lunch, so check their Twitter here or our Mobile Munchies Twitter feed to be sure. In addition to regular Indian main course like chicken tikka masala, vindaloo and murghai, they also have kati rolls and samosas. We’ll have to see how they stack up against the king of kati rolls, Biryani Cart.